You need to drag the ball to the box through all obstacles. You need to find the apartment of the five subjects, and in a certain sequence. The boy got into a strange laboratory. Help to understand what to do. You need to twist the figure so as to lie inside the fruits grouped into three. You need to guess the color, which devised the computer. 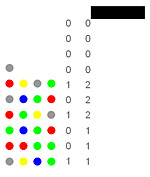 Tsiferka left indicates correctly guessed how many colors is in place in this row, and tsiferka the right - how many colors of the other to guess but is not in their seats. 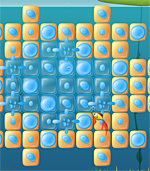 Quite a difficult task, alternately, click on individual squares to get the chain. Each time you click on the box is increased and the need to find the right size square to closed circuit (hint: start from the far-squared). Burst drops to the bottom of a pond with a frog fun, loving chat and then sleep! Your challenge to fill with water every field. 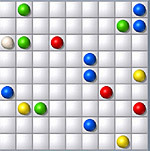 Very interesting logic game. You will, by turning the cubes with letters, words gather on the same topic. With each level of blocks becomes larger, and longer words. 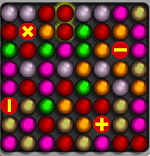 Expand the chips in such a way as to combine a few triangles of one color, then they remove the board from the field. Excellent flash balls or lines (Lines), as we all are accustomed to call them. Fill rocket fuel, otherwise you will not fly away! To do this, you will have to povertet balls and rollers. Ten different images to choose from and tridtsatikusochkovy pazzl to them. Bring order into his apartment, lay out the interior of the ice in its place. The scene in the supermarket! You need to pass out ... But it is not so easy as you might think. You need to change the box to get out of magazina.Upravlenie - pointers. You play the role of assistant on the farm. You need to move all the inhabitants of the farm (chickens, ducks ...) at a place for sleep (blue circles). Office of the arrows on the keyboard. 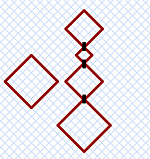 The goal of the game - to place a figure 8 on the board in such a way that none of them stood on a line or diagonal to the other. Loosen the person - it covered mandarins. Click on the Mandarin to be removed. Before you continue, think. On apples acting force of gravity. In this game you have to remove blocks of the same type. The same blocks are removed if they are 3 or more.